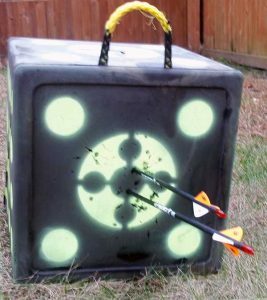 The Rinehart Rhinobrute archery target is a block target that measures 16″x16″x16″, weighs approximately 23 pounds, and retails for around $180. The price for the Rinehart Rhinobrute is a little expensive, but after you’ve owned it and used it for a while, you’ll understand why. I used to be the archer who opted for the cheaper “compressed layer” block target. I would spend $50 on a target that would end up getting tossed after 3 months of shooting. After buying and using about 5 of the old style box targets, I wised up and picked up the Rinehart Rhinobrute. 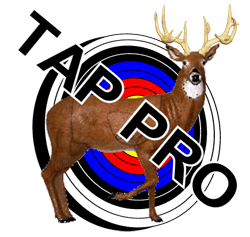 This target is extremely durable and the “self sealing” foam allows the target to keep its form shot after shot. This target should be with me for quite some time. 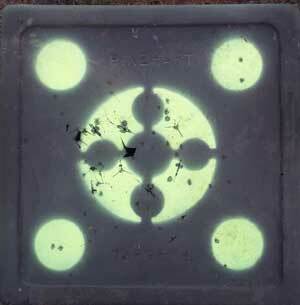 The target consists of 6 sides which are highly visible, even in low light conditions. Two of the sides consist of 12 smaller shooting targets and 4 sides consists of one large shooting target surrounded by 4 smaller targets. After shooting one side repeatedly, simply turn the target around, over, up or down and begin shooting another side. The target also has a very durable handle incased in the foam. With the size of the target and the durable handle, transporting the target from home to anywhere is convenient. The target can fit in the trunk of a car or the back of an SUV or truck. I began shooting the Rinehart Rhinobrute target a couple months ago. During those months, I’ve shot over a hundred arrows at this target using my Elite Energy 32. I’ve used field points, fixed broad heads, and mechanical broad heads (specifically the Rage 2 blade broadheads). The “self healing foam” stood up to the constant hammering of the field points and the fixed broad heads. The target barely looked as if it was being used, until I started shooting mechanical broadheads at it. After shooting mechanical broadheads at the target, I noticed when I pulled the arrow out, parts of the target come with it. Mechanical broadhead use did indeed leave noticeable size holes in the target. I would advise to only shoot fixed blade broadheads or the practice broadhead that comes with your mechanical broadheads. When I began shooting the Rinehart Rhinobrute, the arrows were a little hard to pull out. After repeatedly shooting the target, the foam eased up and the arrows were easy to pull out. I also have left the Rinehart Rhinobrute outside since I received it. The target has been through a normal Illinois weather system: rain (torrential down pours at times), sun, frigid cold, and snow. The target has held up in the conditions and looks exactly like the way it did on the first day. 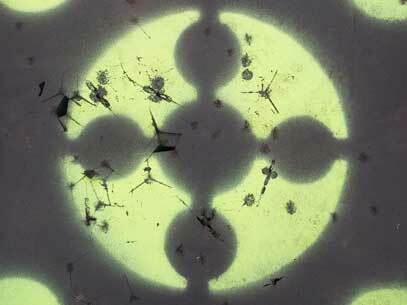 The colors have not faded in the sun and the target has not become waterlogged like most compressed block targets. I’ve shot this target at ranges from 10 yards to 70 yards. The highly visible color of the large shooting zone, allowed me to hit my personal best at 70 yards. 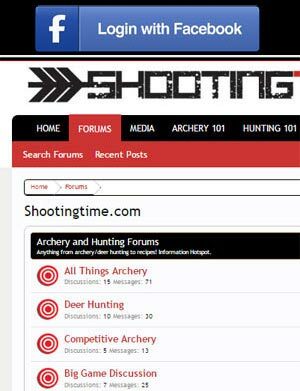 I would recommend this target to anyone that loves to shoot a bow. The target is very durable and dependable. The target can be used indoors and outdoors, and at any kind of shooting light. For more information, visit Rinehart’s website. Highly visible paint for increased accuracy and performance. Durable “self healing” foam that allows the target to keep its form shot after shot with field points and fixed broad heads. Very durable in any weather conditions. Lightweight and compact for easy transport or storage. $180 price tag, but it may be the last target you ever purchase (depending on how much you shoot). The “self-healing” foam doesn’t stand up to mechanical broadheads as well as it does to fixed blade broadheads or field points. The Rinehart Rhinobrute is a solid backyard or portable target for any archer. I recommend owning this target.